Because she loves you, Grandma Pellegrini made you a Valentines soup. She even put hearts in it. It’s a work of art. And because he loves you, Gordon snapped some photos of it. And because I love you, well… I’m just writing to tell you about it. I can’t take any credit. I can just share. 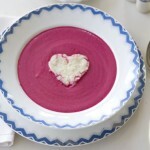 This is a root soup, colored with red beets. It is delicious, I have had it. You should have it too… Grandma P. left you the recipe below. In her own words and everything. It comes with hearts made of polenta in varying colors to suit your mood. Red ones, colored with beet juice in case you’re feeling it. Or white if you want to keep it simple. And a cat tail for garnish. The thing about Grandma P. is that she’s very good at presentation. That is part of why the food tastes so good. And she has lots of charming salt and pepper shakers and plates and cloth napkins and the right silver spoons. I use paper towel to wipe my face. I’m not nearly as classy. I am going to work on that starting this Valentines day. And then the perfect placement of the polenta. Let’s take a look at these shall we? Good grief they’re perfect. A little closer, shall we? I want polenta for dinner for some reason. And then the red ones. In case you want a second helping and want to try all the flavors. Her: Have you planned your Valentine’s Day presentation yet? I’m trying out a chocolate truffle cookie recipe (yes with sugar, no Stevia). I’m going to try baking them in those cast iron heart molds. I have other heart shapes I like to use; one for Coeur a la Creme; others. I also like making red food; puddings, cookies, cake (Red Velvet Cake!). I use beet juice; it makes an intense red. Our annual meeting at the church falls on Valentiine’s Day this year, followed by a soup and bread pot-luck lunch. I’ll bring Borcht. Me: It’s Valentines day? What month is it? Where am I? Did I miss a book deadline? Her: Maybe I’ll have something ready by Sunday. Today’s plans came to a roaring halt when I realized the furnace was off. I’m still waiting for the repair man. Ah, he’s here. Her: It seems awfully complicated. I think you should stick to Food Heroes. I’ve decided what to make for the Valentine feature. Title: Valentine Bisque with Polenta. Shall I leave you guessing, or do you want to hear about it ahead of time? The problem is that I need to shop for a few things (or ask someone to get them for me) today. Snow tomorrow! I’m getting serious again about healthy eating after viewing a disturbing program about diabetes on Oprah yesterday. That’s why I decided not to do the desserts. I’m more comfortable with this non-health-threatening idea. It wll be equally pleasing to the eye. And with that Grandma P. did what she calls her “practice run” for the church potluck. She was going to make sweets, but I’m awefully glad she made this. I can almost taste it. Don’t you think? 3-4 tablespoons grated Pecorino cheese or your choice of cheese, but nothing too yellow! In a large pot mix 4 cups of water with 1 teaspoon of salt. Slowly add the cornmeal, stirring rapidly. Bring to a boil, then lower the heat and cook, stirring frequently for 18-22 minutes, until thickened. At this point you may stir in the grated Pecorino cheese. Pour it onto a platter or large flat pan to a thickness of about 1/3 inch and allow to cool for 30 minutes. Use a cookie cutter to cut out hearts. These may be served warm as is, or fried in butter (Polenta Brustula), but the color won’t stay as white. Note 1: Adding the corn meal before heating the water (the traditional method) helps to prevent lumps from forming. I've been "anonymously" reading your blog for a bit now and I love your Grandma P. stories, recipes, photos and traditions! They remind me of how my own grandmother used to cook (she's not able to anymore) and this especially reminds me how she still gives recipes. Thanks so much for putting a nice smile on my face going into the Valentine's Day weekend and I hope both you and Grandma P. enjoy it as well! I love your grandma. I want to be like her when I grow up. But Grandma, why is the cat on the dinner table? Oops,that was an oversight,Clayvessl;I usually chase him off if anybody's looking. I'm short of tme today so am resorting to a quicker version of the soup,as follows: Skip the sauteing and boil the vegies in the salted water'til soft,add 1 Tlbs Olive oil and proceed as above. It also is qute delicious with shredded coconut sprinkled on this soup, in case you don't want to make the Polenta. Hi Georgia, Lately the days have been flying by but, I have been stopping in to read…..just wanted to wish a happy Valentines Day to you and Grandma P.
Thanks Ray! Happy Valentines Day to you too : ) Thanks for stopping by to say hello. Oh, how I adore this! Almost too pretty to eat – I’d certainly have to at least sit and look at if for a while before digging in.